Sports Costs > How Much Does it Cost to Replace Golf Cart Batteries? How Much Does it Cost to Replace Golf Cart Batteries? Electric golf carts are a popular choice among many golf cart owners because of the durability and the fact they do not have to constantly be refilled with gasoline. However, like a car or any other form of transportation, a battery is going to die sooner or later. How much does it cost to replace a golf cart battery? In most cases, the cost of a golf cart battery is going to depend on the voltage, the brand and store you purchased it from. To budget, be prepared to spend anywhere from $65 to as much as $250 to replace your golf cart battery. A golf cart battery that is known to last more than 400 minutes on a single charge will often cost more than $125. Batteries that are less than $100 tend to be a 6-volt brand that you may have never heard of before and will need to be charged more often. For instance, this UPG 85980/D5722 sealed lead acid battery by UPG retails for $65 to $99. Sam’s Club, for example, has a variety of golf cart batteries that cost anywhere from $85 to as much as $110. According to GolfLink.com, one of the best golf cart batteries, known as the T-105, can retail for $100 to as much as $125. On the other hand, another popular model — the US-2200 — retails for $140 to as much as $200. Popular brands of golf cart batteries include Bag Boy, Club Car, E-Car, Fairplay, Lido, Minn Kota, PowaKaddy, Sun Mountain, Western Golf Car and Yamaha. Most reputable brands will include a limited warranty with the purchase of a battery. If the battery will not hold a charge or malfunctions within a certain time period, you will be able to get your money back or have the battery replaced. The golf cart battery will come with a cord that is used to charge the battery between uses. It should also come with simple instructions for use and installation. Golf cart batteries can come in different amp capacities. The higher the capacity, the longer the charge will hold and the more use you can get out of the golf cart. However, the higher the amp capacity, the more expensive the battery will be. Shipping fees may apply if you purchase the golf cart battery online. If you need a professional to install or swap out the battery, you may have to spend $10 to $25. 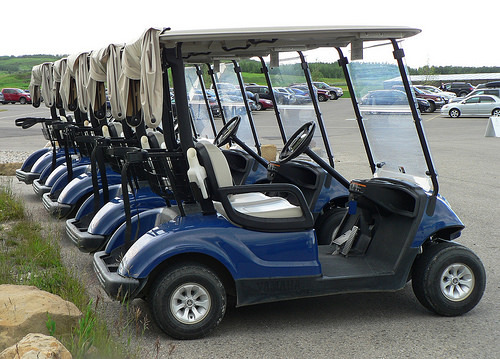 While optional, a golf cart charger can cost an additional $100 to $250. Research the batteries before making a purchase. You are going to want to know how long the battery lasts after a charge and how long you should charge the battery before it is full. The heavier your golf cart is, the more powerful the battery will need to be. Make sure that you research your weight before deciding on a battery. Consider purchasing two batteries; that way, if one were to fail, you would have a backup handy. Always know the dimensions of your battery before making a purchase. Not all batteries are created equally. Batteries tend to last longer if they have a lower output. The faster you drive a golf cart, the more stress you will put on the battery. If your battery died within a few years, check to see if it is covered under a warranty. Do not overcharge the battery. Try to find a charger that will shut off automatically when the battery is done charging. If not, set a timer so you can remember to unplug the battery after a certain amount of time. Try to charge your golf cart between each use; do not wait until the battery dies to charge it. Make sure you turn off lights, radio, or other accessories and remove the key when you are finished using the golf cart. As with anything, the prices are going to vary. Make sure that you price compare before making a commitment. If you are going to buy online, keep your eyes peeled for any special promotions or coupons that may be available. If you intend on purchasing more than one battery, you may be able to get a bulk discount. Installing a golf cart battery is extremely easy to do. Try to avoid paying a professional to install a battery if they have a charge. Usually, if you buy a golf cart battery through a particular provider, you should be able to get it installed for free. The best way to save money on a golf cart battery is to take care of it so it will last as long as possible.